Jim Vance and Dan Burr's ON THE ROPES! Do you remember Jim Vance & Dan Burr’s 1988 graphic novel Kings in Disguise, at the time published in a six-issue limited series by Kitchen Sink Press (and winner of both the Eisner and Harvey Awards for best new series)? I had heard about it over the years, but had never gotten the chance to read the book until last fall. Influencing Machine editor Tom Mayer was editing Kings‘ long-awaited sequel, and he asked me if I’d be willing to write a blurb for it. In addition to sending me the galleys of the new book, I received a present of the original as well—which I thought was wonderful. Well, On The Ropes is in many ways superior to Kings in Disguise. Freddie Bloch, the young protagonist of the original book, is a bit older now, and still navigating his way through the hardships of the 1930s. Freddie is pushed to the edge, as he falls in with Communists, carneys, and criminals. Vance’s complex, heartfelt writing and Burr’s earnest, detailed drawings humanize the plight of all those caught in the ravages of the Great Depression. 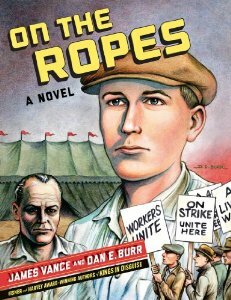 On The Ropes is a refreshing take on the turmoil and politics of the era—and a gripping, dramatic, and frightening tale. It comes out today—please go out and buy it.